I have prepared a short story on the life of Edsel Ford. As most of us know, Edsel died in May, 1943, so it seemed fitting to honor the man on the 46th anniversary of his death, who’s car and club are named after him. The story deals with his youth, his fascination with car design and development, his Presidency of Ford Motor Company and his untimely death at age 49. Let me say that finding articles on Edsel Ford was no easy task. Edsel lived in the shadow of his father so much that very little is known about him even today. Even as President of Ford, he made very few major decisions. It was usually Henry that made the final decisions for the Company. However, Edsel enjoyed cars; especially car design. It was his hobby as well as his specialty. Edsel had other hobbies, like photography, fast boats, painting and sports, but cars remained his lifelong favorite. During his early childhood, Edsel and his father worked side by side on cars. Later on, Edsel became more fascinated by the shapes of automobiles than by their inner workings. As ateenager, he built several speedsters, mostly T-based. Edsel was indulging in a common pastime of the day, one shared by quite a few young men with money, the difference being that Edsel had an unlimited supply of parts. This love of styling and building cars would come in very handy as time went on. I found a statement by Edsel which was dated in 1922 – “Father makes the most popular car in the world. I would like to make the best car in the world – Lincoln”. In the late ’20′s, it was Edsel who guided the styling of the Model A, and gave it the mini-Lincoln look. At the time Henry was too busy straightening out the innards to worry about the A’s outlines. He didn’t care what the car looked like as long as it did what he wanted it to do, and it was painted black (REMEMBER?). Edsel regularly had cars built for his personal use. 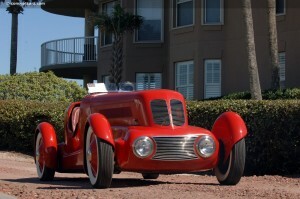 Two of his personal favorites were his 1932 and 1934 speedsters. 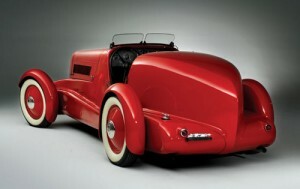 The 1932 was a V-8 Boat-tail speedster, and was built with the help of stylist-designer E.T. Gregorie. The ’32 was a beautiful car with quite a number of radical features for its time. All aluminum body, pantalooned fenders, bullet headlights, no running boards, split windshield and V’d grille shell. 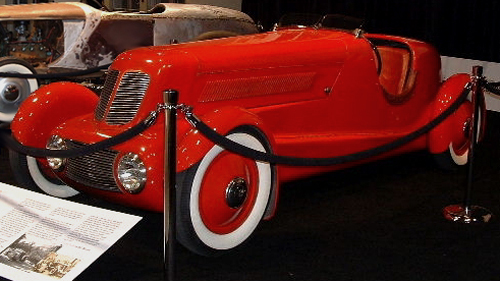 Two years later in 1934, Edsel again called on Gregorie to build him another speedster. 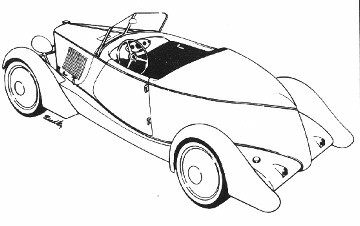 It again had an aluminum body, but this model was lower than the ’32, and the headlights were mounted at the axle height. There were twin-windscreens, no doors, and the overall effect was that of a pure racing car. Edsel has no intention of producing any of these cars in quantity, and for the most part he kept them out of his father’s sight. 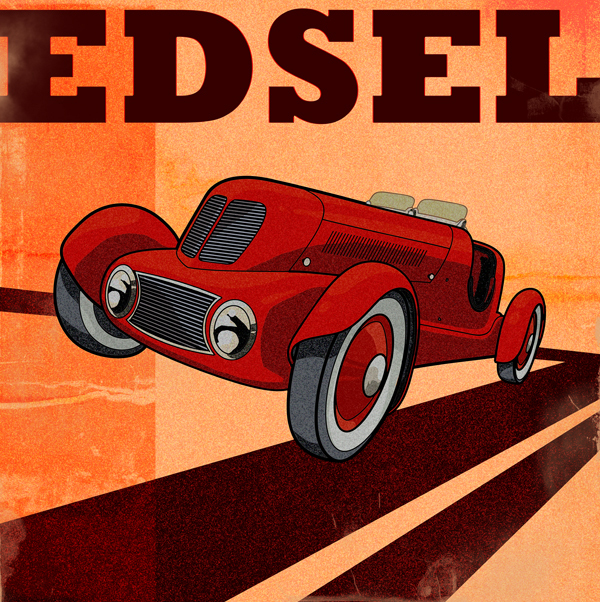 Seems Edsel kept his speedsters inside a gardener’s shed at his home. Edsel became the guiding light behind Ford’s styling section, and as mentioned before, the Lincoln became Edsel’s crowning acheivement. 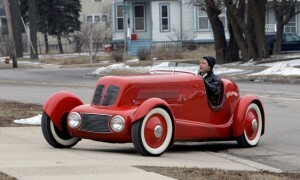 But he also saw the Zephyr and most other pre-war Fords through their various stages of body design. As one can see, these were very happy times for Edsel. Unfortunately, there would be fewer of these happier times as the pressures of running the Ford Motor Company, an over-demanding father, and America’s entry into the Second World War would begin to take its toll on Edsel. Edsel was twenty-five years of age when he became President of Ford, but the appointment was no more than a cruel hoax. Foxy old Henry had redesigned the Presidency and was making noises about organizing a rival firm to build a better and cheaper car than the Model “T”. Henry had no intention of relinquishing control of the Ford Motor Company, nor did he plan to organize another company. He was simply diluting and very effectively the value of Ford’s stock, preparing to buy out the small minority stockholders and assume total control. Edsel was being manipulated, and he would be manipulated, harassed, tormented and humiliated all the remaining days of his life. It backfired, and Henry was furious. Thereafter, Ernest Kanzler found himself ignored, ridiculed, and victimized in every conceivable way. Ultimately, while Edsel was out of the country, Henry had Kanzler fired. On one occasion, Edsel had contracted for the construction of a new office building. It seems both Accounting and especially the Sales department had long since outgrown their quarters. Henry was out of town at the time that the plans were made and the contracts let. (One suspects that this may not have been coincidental!) Upon his return, the elder Ford took note of the excavation that was underway and demanded to know what was going on. Edsel, doubtless with a mixture of pride and dread, described the new building which would supply Company with badly needed office space. Henry wanted to know for whom? This should have been Edsel’s cue to pitch for the needs of the Sales department – something Henry could understand. Instead, however, the younger Ford mentioned first the accountants. Without waiting to hear another word, Henry turned and marched out of Edsel’s office. The next morning, when the accountants reported for work, they found their offices stripped. No desks, chairs, files or telephones. Even the carpeting was gone, and they were out of a job. Henry had abolished the Accounting department with which he had never had any patience with anyway, and overnight had seen to the removal of its furniture and equipment. He then informed Edsel that there was now plenty of room for the Sales staff. Some said it was out of love for his father. Edsel had three sons. Perhaps he was simply hanging on until the day that they could take over. Doubtless there was the factor of family loyalty. For Edsel to have left the Company would almost certainly have depressed the value of Ford stock, all of which was held by family members. Others, more cynical, pointed out that Edsel derived a very handsome income from the Ford Motor Company. Most importantly, from all the evidence, Edsel Ford was simply not a combative individual. Confrontation and conflict were totally foreign to his nature. In ant event, Edsel mostly kept his torment to himself. Only rarely did he reveal his inner emotions to anyone – some perhaps to his wife Eleanor, and to Ernest Kanzler before he was fired by Henry. Frustration and suppressed rage make a poor recipe for good health and long life. Not surprisingly, Edsel fell victim to ulcers. In time, the ulcers led to something far worse. Early in 1942, he underwent abdominal surgery. Ten months later, he was hospitalized again, this time for something called Undulant Fever. (My medical book describes this as a persistent form of Brucellosis transmitted to humans from lower domestic animals, or by their by-products, and characterized by a recurrent fever, sweating and pain in the joints). As part of a bland diet, Edsel had been drinking milk from his father’s dairy, and of course old Henry would not permit the testing of his herd, much less the pasteurization of the milk. But the doctors found something far worse than undulant fever, as bad as that was. Edsel’s ulcers had become cancerous, and his condition was deemed inoperable. He was sent home to die. Henry Ford refused to admit the truth about his son’s condition. “It was all due to Edsel’s high flying lifestyle”, he said. “If Edsel would stop smoking or eat a proper diet, or go see other doctors, his health would improve”. But early in the morning of May 26th, 1943, death came for Edsel Ford. As I mentioned earlier, he was only 49. This story might have had a different ending if Edsel had been able to stand up to his stubborn father, demanding that he be allowed to run the Company without interference. But Edsel was Edsel, putting the feelings of others before his own. On his community. For years Edsel Ford was one of the largest donors to the Detroit Community Fund. On the Arts. 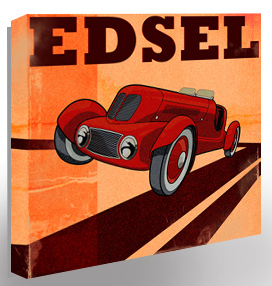 A talented landscape artist in his own right, Edsel served for many years as President of the Detroit Arts Commission. On the product line. It was Edsel who influenced his father to take over the bankrupt Lincoln Motor Company, saving one great car from the fate of so many others during the ’30′s. On his family. Edsel was the kind of parent who always was there, sharing the joys and problems of his children. Edsel’s final irony was the fact that the car that was intended by his family to do him honor turned out to be a dismal flop. And, yes, on his father. In the end, it was Edsel who persuaded the old man to replace the Model “T”, to mechanize his windshield wipers, to adopt – finally – hydraulic brakes, to engage in some semblence of long range planning and to make peace with organized labor. One has to wonder whether Henry Ford ever comprehended what he had done to his only son. It seems unlikely. Certainly he never even began to understand this complex gifted man, nor did he ever really try. Nevertheless, he was grief stricken at Edsel’s death. Less than four years after Edsel’s death, the old man himself was gone. 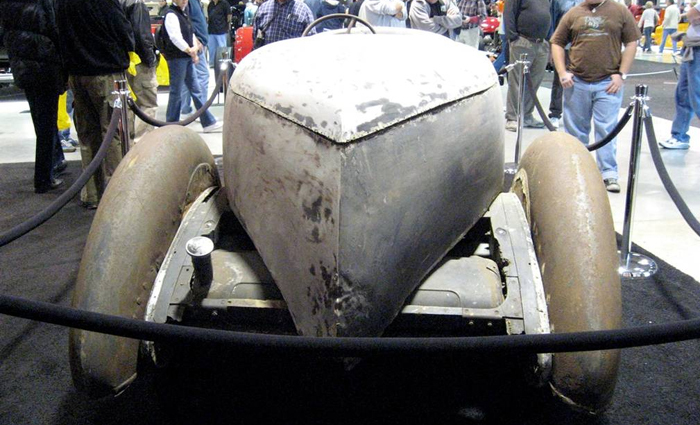 Edsel’s 1934 speedster was sold in Atlanta, Georgia for $1000 after Edsel Ford’s death. It was next seen for sale in Road & Trackmagazine in 1948 for $2500, but did not find a buyer. It remained in storage until 1958, when it was purchased by John Pallasch of Deland, Florida for a tidy $603. Under John’s care, the car’s gunmetal gray exterior was painted red and the upholstery was replaced with matching red leather. As of 1970, the car was reported belonging to Earl Pallasch of Deland, Florida. It was spotted in Amelia Island, Florida in January 1999, having been purchased by Bill Warner, founder of the Amelia Island Concours. On March 8, 2008, the car changed hands again, selling at an RM Auction for $1.74 million.